Special Needs Aren’t Always The Most Difficult – Hi Blog! I'm Dad. I’m going to be completely honest up front. Certain aspects to having a non-verbal son on the Autism spectrum can be very hard. There are some big picture worries like questions about his future, immediate issues like making sure he understands the world around him, and terrifying thoughts like hoping he doesn’t wander off. Add these to the laundry list of concerns that any parent would have for any of their children and it can seem a bit overwhelming at times. Because of that, people assume that Lucas takes up the bulk of my daily agitation. After all, his issues can be the most easily observable. It just seems obvious that he must cause the most concern. It leads to comments that, while well-intentioned and somewhat on the mark at times, aren’t always completely true. You must have a lot to deal with. I know Lucas must be difficult to handle. Taking care of your son must be very hard. I’m sorry. These comments come from a place of sympathy and concern. I don’t fault anyone for saying them. In fact, there are times when they are completely true. My son, just like anyone else in my life, has days where he makes me want to rip my hair out. Then again, some days he doesn’t. Actually, most days he doesn’t. Yeah. Please don’t tell my wife and daughter, but on a day-to-day basis, my son is usually the easiest one in the house to handle. In fact, that holds true for all people – even those outside my home. 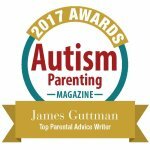 For all the worries his Autism might cause me, and there are quite a few, there are tons of aspects to his personality that make him so easy to care for and a far cry from the burden some falsely assume he can be. For starters, I can and do tell Lucas anything. He doesn’t get offended or hold things against me. In fact, since he was a baby, I have always spoken to him as if he was an adult. I tell him things that bother me and some pretty private thoughts about those around us. Of course, there’s always the concern that he might start suddenly speaking and tell an acquaintance, “My dad always talks about how annoying you are.” Sure, he might offend that person when that day comes, but, at that point, we’ll be too busy cheering him on for speaking that we won’t even care. He doesn’t ask for gifts. There has never been a midnight rush to Toys R Us for Hatchimals so that Lucas will have a happy holiday. All the presents he gets are based mostly on our own guesswork and he never desperately needs a material thing to be happy. There have been countless instances of him sitting among a pile of half-opened birthday presents, playing on his crusty old iPad. While he might eventually work them into his playing rotation over time, overall they’re not that important. We could realistically never buy him another toy again and he wouldn’t bat an eye. He loves what he has and while he might come to love what we buy him, there’s no demand for anything. We routinely will ask our daughter, as she’s whining for the latest toy trend, “Why can’t you be happy with what you have? !” Our son, who is supposed to be the difficult one, doesn’t ever need to be asked that question. He already is. It doesn’t stop at presents either. If I wanted to, I could watch Lucas for a week and spend almost no money. He doesn’t need to go anywhere or get anything Sure, he enjoys getting in the car and taking a ride, but there’s never any cries of, “I’m bored!” He’s content with being home and, if allowed to, will play in the living room from sunrise to sunset. That’s not to say that we let him do that. It’s just that, if we wanted to, we could. That’s pretty much the opposite of difficult. His good qualities actually make him easier to handle than most people you might encounter on a regular basis. Lucas isn’t passive aggressive. He’s not rude. He doesn’t hurt my feelings or start fights. He’s not fussy about what he’s wearing or where he sits at the table. He goes right up to bed when he’s tired and enjoys listening to me sing during his bath time. If I’m having a bad day, I can scoop him up and give him a hug that he will almost always return. Sometimes, he’ll even come and get me to sit next to him as he watches TV for no other reason than to have me there by his side. I guess you could say that he consistently makes me feel better about myself than pretty much anyone. It’s because there’s no requirements to his love for me. He doesn’t hug me because he wants toys or presents. He does it because he genuinely enjoys my company and knows how I feel about him. As I’ve mentioned before, one of the greatest things about my son is how I’m greeted when I go to get him up from bed. Any morning I approach his door, I’m met with excited claps and jumps. I step over his safety gate cheering and he hops around me with insane enthusiasm. As I take a seat on the ground, he wraps his arms around my shoulders with happiness. Basically, because of Lucas, I start my day feeling like a rock star. Do you know who else does that for me? No one. Ever. So yeah, having a child with special needs is hard in some ways. But having a child with any needs is hard in some ways. In fact, just being a person is hard in some ways. Sure, he has moments where he causes me grief. Then again, so does everyone else in my life. It’s not unique to him as a member of our family. So if you see me with an annoyed face in the morning, you can feel free to assume that it’s something related to my non-verbal son. You might be right. Then again, it’s probably more likely that my wife finished the peanut butter without telling me or my daughter told me that I look really old. The irony? I’ve probably already complained about it all to Lucas.